In psychology, desensitization (also called inurement) is defined as the diminished emotional responsiveness to a negative or aversive stimulus after repeated exposure to it. It also occurs when an emotional response is repeatedly evoked in situations in which the action tendency that is associated with the emotion proves irrelevant or unnecessary. 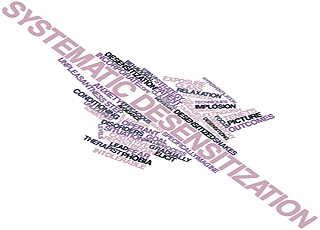 Desensitization is a process primarily used to assist individuals unlearn phobias and anxieties. John Wolpe (1958) developed a method of a hierarchal list of anxiety evoking stimuli in order of intensity, which allows individuals to undergo adaption. Although medication is available for individuals suffering from anxiety, fear or phobias, empirical evidence supports desensitization with high rates of cure, particularly in clients suffering from depression or schizophrenia. The hierarchal list is constructed between client and therapist in rank ordered series of steps from the least disturbing to the most disturbing fears or phobias. Secondly the client is taught techniques that produce deep relaxation. It is impossible to feel both anxiety and relaxation at the same time, so easing the client into deep relaxation helps inhibit any feelings of anxiety. Systematic desensitization (a guided reduction in fear, anxiety or aversion) can then be achieved by gradually approaching the feared stimulus while maintaining relaxation. Desensitization works best when individuals are directly exposed to the stimuli and situations they fear so anxiety - evoking stimuli are paired with inhibitory responses, This is either carried out by performing in real life situations (known as vivo desensitization), or if it is not practical to directly act out the steps of hierarchy, clients can observe models performing the feared behaviour (known as vicarious desensitization). Clients slowly move up the hierarchy repeating performances if necessary, until the last item on the list is performed without fear or anxiety. Animals can also be desensitized to their rational or irrational fears. A race horse who fears the starting gate can be desensitized to the fearful elements (the creak of the gate, the starting bell, the enclosed space) one at a time, in small doses or at a distance. Clay et al. (2009) conducted an experiment whereby he allocated rhesus macaques to either a desensitization group or a control group, finding that those in the desensitization group showed a significant reduction in both the rate and duration of fearful behavior. This supports the use of PRT training. Desensitization is commonly used with simple phobias like insect phobia. Desensitization also refers to reduced responsiveness to actual violence caused by exposure to violence in the media. Desensitization may arise from different sources of media including TV, video games and movies. Violence can prime thoughts of hostility with the possibility of effecting the way we perceive others and interpret their actions. Research shows that initial exposure to violence in the media produces a number of aversive responses such as increased heart rate, fear, discomfort, perspiration and disgust. However, studies conducted show that prolonged and repeated exposure to violence in the media reduces or habituates the initial psychological impact until violent images do not elicit these negative responses. Eventually the observer becomes emotionally and cognitively desensitized to media violence. In an experiment to determine the effects on violent video games causing physiological desensitization to real-life violence, participants played either a violent or non-violent video game for 20 minutes. After that, they watched a 10 minute video containing real-life violence while their heart rate and galvanic skin responses were being monitored. The participants who played violent video games previously to watching the video showed lower heart rate and galvanic skin response readings compared to those who had not played violent video games displaying a physiological desensitization to violence. To understand the effects of repeated exposure to violence, researchers have suggested that viewers become comfortable with violence that is initially anxiety provoking, much as they would if they were undergoing exposure therapy. Look up Desensitisation therapy in Wiktionary, the free dictionary. Please browse our fully updated library of professionally produced Hypnosis Downloads and Hypnosis Scripts for advanced self hypnosis audio mp3s and indirect hypnotherapy scripts relating to: desensitization therapy, desensitization therapy definition, anxieties, cure for clients suffering from, depression, fear, inurement, phobias, schizophrenia, steps to desensitization, systematic desensitization therapy, unlearn, vicarious desensitization, vivo desensitization, what is desensitization therapy. Please browse our Hypnosis Online Store for books, cds, downloads, dvds, ebooks, mp3s, scripts, and videos relating to: desensitization therapy, desensitization therapy definition, anxieties, cure for clients suffering from, depression, fear, inurement, phobias, schizophrenia, steps to desensitization, systematic desensitization therapy, unlearn, vicarious desensitization, vivo desensitization, what is desensitization therapy. Please visit Hypnotic-world.co.uk for advanced self hypnosis audio mp3s, hypnosis courses, and hypnosis pdf relating to: desensitization therapy, desensitization therapy definition, anxieties, cure for clients suffering from, depression, fear, inurement, phobias, schizophrenia, steps to desensitization, systematic desensitization therapy, unlearn, vicarious desensitization, vivo desensitization, what is desensitization therapy. Please visit Hypnotic-world.com for more information relating to: desensitization therapy, desensitization therapy definition, anxieties, cure for clients suffering from, depression, fear, inurement, phobias, schizophrenia, steps to desensitization, systematic desensitization therapy, unlearn, vicarious desensitization, vivo desensitization, what is desensitization therapy.